There's a new effort underway make hundreds of thousands of dried and preserved plants collected along the East Coast available through a digital database. For centuries, explorers, scientists, and amateur botanists scoured the country to document and preserve plant species. Once prized like fine art, the collections were often bequeathed to institutions that housed herbaria, or libraries for plants. Over time these collections became obscure, and fell out of use. Aside from the occasional researcher who had to schedule an appointment to view the records, and often travel long distances, these plant collections were difficult to access for most people. Rick McCourt, botany curator at the Academy of Natural Sciences of Drexel University in Philadelphia, helps manage the oldest herbarium in North America. 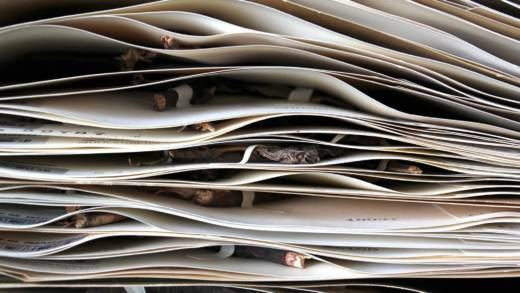 The herbarium has an estimated one and a half million plant species in its collection. About 35,000 plant species were collected along the East Coast. The new database will allow researchers to answer questions about climate change, conservation and urbanization. Questions like: "How has the environment changed?" said McCourt. "What plants occur where? Do they occur someplace differently now than they used to? Are they vanished or gone from an area?" He says the data contained in that herbarium might even raise the possibility of using plant DNA to bring back extinct species. "It's more like a Jurassic Park dream," McCourt says. "But DNA is DNA, who knows? Before 1952 we wouldn't have known what DNA was, much less that you could get it out of museum specimens." At the Academy, the 1.5 million plant species in the collection are housed in large metal cabinets, which are compressed together in a windowless, 3rd floor room that smells pungently of herbs. The plants were dried, then sewn, glued or taped to paper, and placed in manila folders that are stacked up inside the cabinets. As he pulls out specimens, McCourt points to the careful handwritten notes from the collector, detailing the location and date of the specimen. Some date back 400 years. He says the collectors took pride in their herbarium. "I almost think of it like any collector, like baseball trading cards," said McCourt. "It was a competitive game to see if you could describe a lot of new species, find a lot of new species, make them valuable to the people you were working for or your own reputation scientifically. And there were different levels of vanity associated with it." Whether those collectors searched for valuable medicinal or agricultural plants, or whether it was simply a labor of love, few would have known they were creating such a rich database for future scientists. Funded by the National Science Foundation, the Mid-Atlantic Megalopolis Project will put about 800,000 records from about a dozen herbaria online via high-resolution photos of plant specimens that span the urbanized corridor from New York City to Washington, D.C.
At Muhlenberg College in Allentown, plant ecologist Rich Niesenbaum has begun using the data from the herbarium to help find out what made some of the plants in its collection go extinct. Muhlenberg already digitized about 50,000 specimens and added it to the Megalopolis database. The database allowed student Lindsay Press to pull the records of plant species that have been registered by the Pennsylvania Department of Environmental Protection as extinct, rare or endangered. But going by the handwritten notes is difficult. "They would say by a railroad track, and that railroad didn't exist anymore," said Press. Her professor, Rich Niesenbaum, has begun the hunt for these plants to help document the impact of urbanization, but also to possibly protect vulnerable species and the region's biodiversity. "If we find a rare plant and it exists in Pennsylvania and it's extinct in every other state, then that becomes a valuable piece of information," he says. "It's not just extinct in Pennsylvania or rare in Pennsylvania, it's possibly being lost as a species nationally." On a blistering hot day in August, Niesenbaum and Press head out to hunt for one of the rare specimens in the collection. The specimen collection of Potomogeten zosterformis, otherwise known as flat-stemmed pondweed, includes notes from the amateur botanist that it was found on July 20, 1924 in "cedar creek south of Fairview Street." The notes also mention a quarry. Niesenbaum says there's only one old quarry in Allentown so he's pretty sure he knows where to go. The banks of Cedar Creek in this part of Allentown are lined with thickets of reeds and cattails. The creek is across from a city park, so Niesenbaum hopes the plant will be found. But so far, he's been unlucky with these searches. Invasive species like Japanese knotweed and stiltgrass crowd out everything else except poison ivy, providing one reason why some of these species may have gone extinct. Niesenbaum points out railroad ties lying in the brush, and, spotting grass, he then jumps in the creek. He pulls out a handful of aquatic grass, and says he'll take it back to the lab to grow it and see if it's a match. "I mean that's exciting because you know as as a plant hunter we spend a lot more time hunting and looking than actually finding," he says. "And so if this is indeed the rare plant and it's here right now in the urban environment in an urban setting that offers a lot of hope." Several weeks later, he's still unsure if the grass found in the creek is what he was looking for, but he's hoping to get a team of students together to search for more. "This is history," he says. "This is historical data right in front of us. We can start to ask all sorts of questions that we were unable to answer or would be unable to answer without this kind of resource, we can't go back in time."